In the unique book of "Death Spiral," a young girl named Faith takes on the unexpected, overdose death of her junky mother. Forced to face the fact that her mother is dead, she tries to carry on and keep living a normal teenage life, but there is something itching her brain. When the sudden death of a family friend who too was a junky, Faith realizes that these deaths are not natural; there is something strange. With the help of her friend Anj (who she is not sure to trust or not) and the cute "New Guy" (who is not afraid to speak his mind) they try to untwist the problem. Who can she trust? Who can she rely on? Find out in the wonderouss book "Death Spiral." 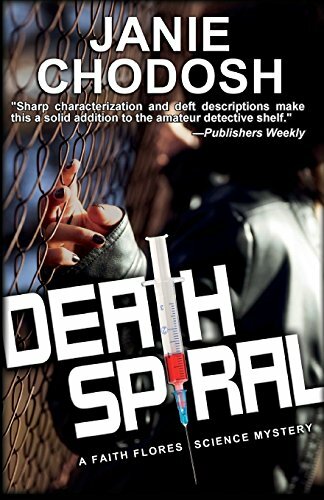 In my opinion, "Death Spiral" was a five star book. It is unique, all in all. In the book it talks about teens and their exposure to drugs and death. You don't usually find these kind of things in books nowadays. People don't realize that there are bad and hurtful things out there. Drugs and death do exist; we just try to avoid paying attention to them. But sometimes we need to be open to these things and remember that there are teens who are exposed to this. I would like to say thank you to the author for opening my eyes and sharing with me a book that touches on these issues. There is talk about drugs and death.